Find More Alpha in Your Process. Optimize your investing process with award-winning research, unparalleled data, and sophisticated software from one of America’s largest and most trusted research providers. Access decades of equity, mutual fund, ETF and economic data. Go beyond sales and earnings estimates to see forecasts on line-item financials and key non-financial metrics – powerful drivers of stock prices that are often overlooked. Perform original research that supports actionable investment strategies. Customize data delivery, integrate spreadsheet models, and create reports that make you look great in front of clients. Maximize the accuracy and effectiveness of your portfolios. Use Zacks' proven, equity and mutual fund models to gain the insight you need to outperform any US benchmark. Research is the core of what we do. Screening, charting, multi-factor analysis, backtesting and more - Zacks research helps you optimize your investing approach. Zacks knowledgeable, U.S-based support team is dedicated to helping you solve problems and integrate our data and software seamlessly into your workflow. 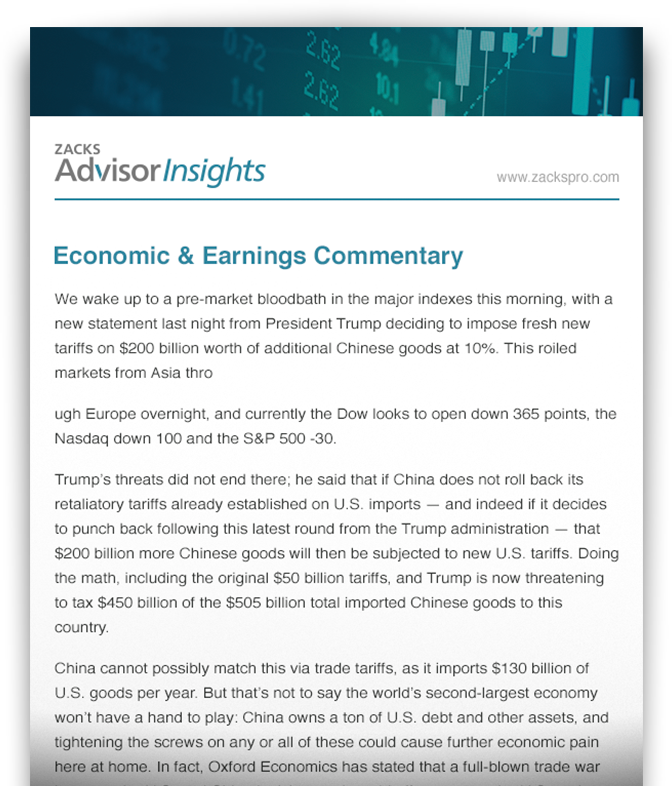 Not just a market recap, “Zacks Advisor Insights” is Zacks’ free newsletter that provides vital market updates every day, augmented by Zacks award-winning research. At Zacks, we've championed independent research since 1978, when our founder, Len Zacks, published a highly influential paper which first detailed his innovative investment approach: analyzing earnings estimate revisions and surprises to predict stock movements. Since then, Zacks has continually expanded and refined that research to help institutions and high net worth clients invest more effectively. Today, Zacks Investment Research is one of the largest equity research providers in North America. From individual advisors to full IR teams, Zacks Professional Services can help you optimize your process. Talk to one of our professional consultants today about the data and tools that you need to take your investment process to the next level.